Extraction: natural non-ionic surfactant derived from coconut oil and glucose. Benefits: used in the formulation of personal hygiene products in which abundant foam is desired. It also works as a mild cleanser and maintains skin’s natural pH balance. It is 100% biodegradable, making it environmentally friendly and suitable for all skin types. Benefits: excellent moisturizer for skin and hair. It smooths skin and hair and acts as a natural non-ionic hair conditioner to smoothen hair fibres. Suitable for all hair and skin types. Extraction: it comes from the controlled enzymatic hydrolysis of wheat and is gluten free. It is rich in proteins and amino acids, essential elements for a healthy metabolism. Benefits: it increases skin’s firmness and helps to form a film to retain moisture and provide luminosity. It prevents the skin from drying out and diminishes the appearance of wrinkles. 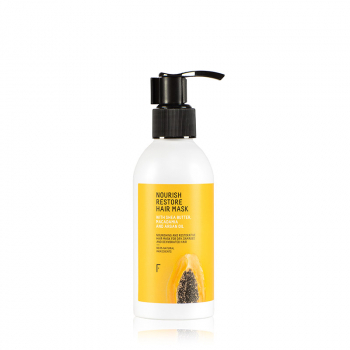 It nourishes and repairs hair, detangles, provides shine and hydration. Extraction: in addition to being widely used in healthy infusions, rooibos tea has excellent properties to be used in natural cosmetics. It has powerful antioxidant, anti-inflammatory and antimicrobial properties. Benefits: when used in hair care products, rooibos tea works to stimulate hair growth and prevent hair loss. It also makes hair shiny and smooth. Rooibos’ antioxidant power is due to its superoxide dismutase enzyme content which acts by capturing free radicals. Extraction: menthol is an alcohol that is extracted from peppermint essential oil. Peppermint is considered the most precious of the mints. Benefits: helps restore natural pH levels that are deteriorated via the use of conventional shampoos. It offers a delicate and deep cleaning action while removing grease without damaging the hair. It also strengthens hair follicles, refreshes and prevents scalp irritations. It provides both soothing and refreshing properties. Extraction: this essential oil is obtained from the lemon, an acidic citrus fruit high in vitamins, especially in vitamin C.
Benefits: purifies oily skin, opens clogged pores and improves acne-prone skin. Like many scented oils, lemon oil has antioxidant and calming properties which benefit the skin. It also provides benefits on the hair: it increases capillary resistance prevents the scalp from over drying and treats dandruff. Extraction: this extract is obtained from the calendula flower, an aromatic plant form the Asteraceas family. Benefits: calendula is a powerful agent used to treat scars and stretchmarks. It stimulates the body’s natural healing action, regenerates damaged skin and allows the body to produce more collagen (vital to skin recovery). It also works as a nourishing moisturizer and has anti-inflammatory, soothing and protective properties. Extraction: camomile is plant that has been used since ancient times in natural medicine and in the preparation of home remedies, creams, cosmetics and other skin products. It has also been traditionally used as a digestive infusion. Benefits: works as a natural anti-inflammatory, calming and purifying agent. Chamomile stimulates the healing of minor wounds and inflammations of the skin, in a completely natural way. Applied in the facial routine, it relieves chafing, redness and skin rashes. It also has softening properties thanks to its essential oils and flavonoids, making it common in cosmetics products catering to sensitive skin. It takes care of skin without altering the hydrolipidic mantle or its physiological pH. Extraction: a pale yellow fruit with a juicy pulp. Lemon is a citrus fruit rich in vitamin C, flavonoids and essential oils. Benefits: it functions as an absorbent and astringent and provides a citric aroma, antioxidant action and helps eliminate excess oil on the skin. It has an energizes and revitalizes. It helps to diminish the dark spots, cure acne and provide shine to dull hair. Extraction: a combination of fruits with hints of grapefruit, papaya and peach. It’s scent is also enhanced with lemon essential oil. Benefits: the essential oil provides a pleasant, refreshing citrus aroma. 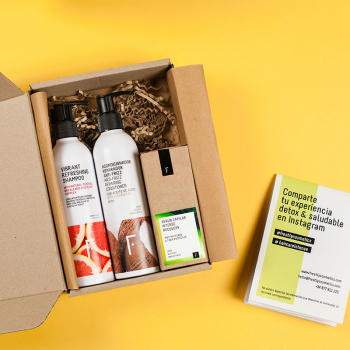 As a whole, the natural fragrance of Refreshing Shampoo Detox is very energetic and revitalizing. Extraction: Irish moss extract is a mucilage extracted from Chondrus crispus algae. Later, it is dried and pulverized. When rehydrated this extract is very versatile, it can be used as a thickening agent or for the production of resistant films. Benefits: excellent moisturizing agent. Copolymers are typically used in hair products to form transparent gels. Irish moss extract an excellent natural alternative. It gently cleans and sooths skin and hair. It also has anti-inflammatory properties. Extraction: sodium salt of cocoyl-glutamic acid. 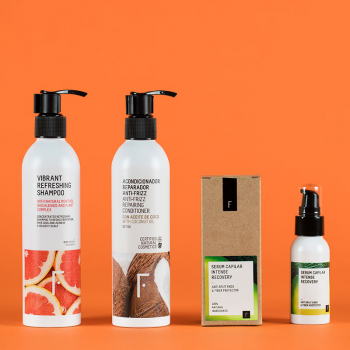 This natural ingredient is extracted directly from coconut oil. Benefits: surfactant and cleaning agent. Extraction: natural monoester derived from glycerol and oleic acid. Creates water-oil emulsions where water is the most abundant compound, but it can also be used as a co-emulsifier and thickener for formulations where the composition is mostly oil. Benefits: it is used as an emulsifier and non-ionic co-surfactant in various skin and hair care products. Leaves the skin feeling soft and smooth. Extraction: citric acid is a weak organic acid found in fruits such as lemons and oranges. Lemon juice contains approximately 5-8% citric acid. Benefits: citric acid and its salts: Diammonium, Potassium and Sodium help to preserve cosmetics since they are metal chelating agents. Citric acid and its salts are also added to cosmetics to help regulate the acid / base levels. Functions as a powerful antioxidant and helps to regulate and maintain skin’s hydration and elasticity. Extraction: oily liquid derived from vegetable oils and citric acid. Benefits: it is used as an antioxidant, emollient and skin conditioner. Extraction: The apple is a very refreshing and moisturizing fruit because of its high water content. Apple cider vinegar is extracted from the juice of the apple’s pulp. Benefits: apple cider vinegar stimulates hair growth and strengthens the roots. It balances hair’s pH levels and seals cuticles to effectively prevent split ends and frizz. It also helps to easily untangle and soften hair, leaving it more manageable. Extraction: coconut is a tropical fruit obtained from the coconut tree. Cold pressing thExtraction: the coconut is a tropical fruit obtained from the coconut tree. The oil is obtained by pressing the pulp of the coconut which produces a fat-like substance from which the coconut oil is later extracted. This vegetable oil is composed 90% of saturated fatty acids. Benefits: coconut oil is one of the star ingredients in any beauty routine. It is perfect for hair care, serving as a conditioner to repair and restructure dry and damaged hair and help prevent breakage. It is rich in fatty acids that nourish and moisturize hair and leaves hair feeling smooth and silky. It is also great for skin, working as a powerful moisturizer by hydrating dry, damaged skin and leaving it feeling smooth and refreshed. Additionally, it has remarkable restorative and antioxidative properties.nditioner, it repairs damaged hair and restructures it increasing its resistance. Rich in fatty acids, it nourishes and hydrates the hair. Combined with rinsing, it leaves a soft and silky effect. Extraction: this extract is obtained from the root of the Rhodiola rosea plant. This species of plant is able to survive in extreme climates in the polar regions where production of this extract is stimulated. Benefits: protects cells from external damages. Visibly reduces the frizz, protects hair and helps maintain hair’s original shape and structure of the fibres. It also has antioxidant properties that help prevent premature ageing. Extraction: the pomegranate is a thick-skinned fruit with seeds. Its juice is rich in antioxidants, polyphenols and flavonoids. Rich source of vitamins (C and B5) and minerals such as potassium. Benefits: prevents hair loss and leaves hair feeling healthier and brighter. The pomegranate extract helps hair maintain its natural tone for longer. Pomegranate extract also works great as a sunscreen and offers protection against free radicals that cause skin aging. Extraction: the extract comes from the flowers and leaves of the Verbena plant, a tall-stemmed herbaceous plant with small leaves and violet and white flowers. Benefits: stimulates hair growth and prevents hair loss. It also strengthens the scalp and provides softness and shine. Regulates the nervous system and provides a soothing effect. Benefits: the essential oil provides a refreshing and revitalizing aroma. This natural perfume is used in the Anti-frizz Repair Conditioner.